In June of 2007 I had the good fortune to attend a landscape photography workshop in Banff, Alberta, Canada. This was led by Neil and Susan Silverman (more about Neil in another post) and Matt Klowskowski of the National Association of Photoshop Professionals (NAPP). During this adventure, my wife Sandra and I got to know Matt quite well. 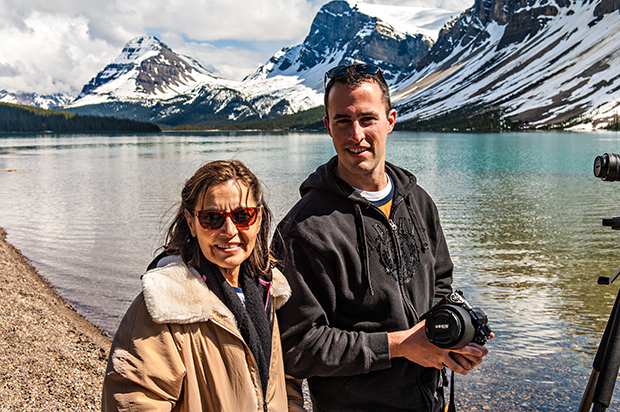 Sandra and Matt at Bow Lake. I had recently developed an interest in high dynamic range (HDR) photography and Photomatix. As such, I shot a bracketed series of images of every scene I photographed. Matt, I and the rest of our group shot the magnificent lakes side-by-side: my 9 shots to their 1. Matt poked a bit of lighthearted fun at me, calling me "9-Shot Barney." Later, in his blog (http://www.mattk.com) Matt realized that he too should have shot HDR images at Banff. To see his post, type in "Barney Streit" in the search box and read the second post "The Story Behind My Oldest Portfolio Photo - Moraine Lake." Therein, he called me a "visionary." Moraine Lake with Canoes by Sandra Hotzakorgian. Naturally, this was my favorite image of the trip. A larger version can be seen in the Landscapes gallery. Why is it so difficult for us photographers to let go of our preconceptions and try new things? I suspect once we shoot something and like the result, we become afraid to shift our paradigm of how to photograph because we may not like the result. We seem to forget that we can simply delete the files we do not like.